1. Grease a 33cm × 23cm Swiss roll tin or baking tray, at least 2.5cm deep with oil and line with parchment paper. 2. Melt the butter in a large saucepan over a medium heat. Add the marshmallows and nutella and stir until melted and combined. Gently stir in the Rice Krispies until well coated. 3. Working quickly before it sets, spread the mixture into the tin, pressing down gently with the back of the spoon to smooth it out. If it is setting too quickly, lay a sheet of parchment paper on top and use the heel of your hand to spread it flat. Leave for about 30 minutes, covered with parchment, until cool and set. 4. For the filling, place the cream cheese in a medium bowl and sift in the icing sugar. Add the vanilla seeds, and beat until smooth. Cover with cling film and chill for at least 15 minutes. 5. When set, lift the cake out of the tin and peel the paper off the top and sides only. Spread the filling evenly just to the edges. Using a sharp knife, mark an indent along one short end, about 2cm in from the edge. From this end, use the parchment to help lift the cake and roll it over, peeling off the paper as you go. Roll it away from you, fairly tightly, until you reach the end. Sit it seam-side down on a serving platter. 6. Arrange mini golden eggs on top to stick. Seal the remainder in a small food bag and bash with a rolling pin until roughly smashed. Sprinkle them over and serve. 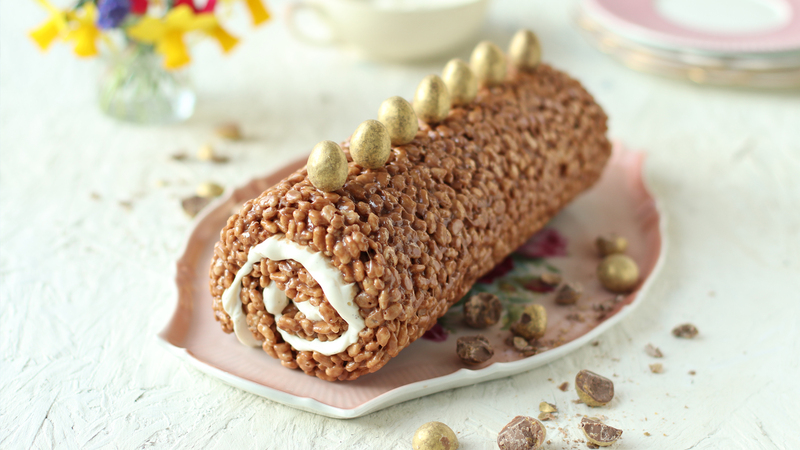 Alternatively, to make a chocolate and peanut butter roll: In the filling, replace 100g of cream cheese with 100g smooth peanut butter. Roll the finished cake in 75g finely chopped hazelnuts or salted peanuts.